Do not design curbs that approach buttresses at an angle. “Hinge Bind” may occur, making it impossible for the door to operate. Always design curbs so that they approach buttresses at a 90-degree angle. Very tall steam shower openings require a secondary piece of glass (transom), or the soffit can be framed lower to fill the gap. Framed products over 78” tall require transoms. Frameless products over 84” tall require transoms. Pitch seats to shed water. Install pans below seats. Pitch curbs INTO the enclosure to allow drainage. Best to use a slab. In most cases, you will save money. Shower soffits must plumb down precisely to the footprint of the lower curbs. Failure to address this issue will produce disappointing results. Never position body sprays opposite an enclosure door or other opening. Tempered glass panels cannot be manufactured in dimensions less than 3 ½“. If you are planning a frameless enclosure, DO NOT use raised, decorative tile on ANY part of the door swing area. DO NOT USE GLASS TILES! Drilling necessary during the installation process inevitably results in cracking. A return visit from an irritated tile installer to remove the overhang. Out-pitched curb (top right) spills water outwards onto the bathroom floor. Dead-level curb (bottom right) results in standing water… a sure catalyst for mold and mildew. A pitch between 3/16” and ¼ “ is ideal for shedding water back to the shower drain. Otherwise, a costly pattern-cut door may be required. A buttress wall or tub deck that ends with a small notch of glass results in a brittle “icicle” that may require a separate lite of glass (with and ugly seam) or a bulky metal build-over. Yield NO LESS THAN 5” of finished tile to your frontal glass door or panels. When installing a frameless enclosure onto a marble or granite deck, overhangs up to ¾” can be notched with minimal risk of breakage. 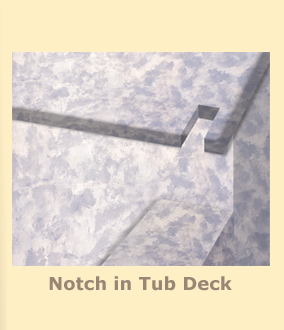 When the overhang of a marble or granite tub deck exceeds ¾”, we suggest the use of a metal filler to build out and fill the gap go the shower enclosure. Always provide wood blocking where doors hinge or panels are anchored, especially with metal studs. Never run plumbing pipe through studs where an anchoring screw may puncture it. When designing an enclosure that has a buttress wall, a notched door is a possible solution. A more practical approach is to use an in-line panel. These panels cannot be made less than 3 ½“ wide… so be sure to frame the buttress to include the extra width of the panel. Allow extra groove width for caulking (Ideally, add ¼” to glass thickness to allow 1/8” caulk joint on either side). Only groove where a panel is located, never groove for a door. Pitch seats and shower floor pans so the water flows to the drain area. Otherwise, stagnant water or puddling will occur. Pitch the curb sill under the door, on knee walls, and under all fixed panels approximately 3/16” towards the interior of the enclosure. It is best to use a continuous piece of marble or granite to minimize grout joints under the glass. Bellied, Bowed and Uneven Walls create inadvisable load on hinges and impede their grip on the glass. If gaskets are required, uneven walls may bind and cause premature wear on the gaskets. Extreme situations may warrant the use of a header and/or pivot hinges. Planning to have your shower door reach the ceiling? First make sure the door won’t be hampered by anything installed on the ceiling when it swings open. If an exhaust fan, vent or light fixture is placed in the path of the swinging door, a transom may be required to give the door clearance. If your neo angle shower enclosure includes a “knee” wall or wall, make sure that the shower door meets the structure at a 90-degree angle to accommodate the requirements of the hinges. This is not a restriction when glass meets glass at a 135-degree angle.